This interview with Mindi was unplanned, yet oh so serendipitous. Shortly after an on-stage performance, she approached us in the Bourbon and Beyond media tent, curious about what “Babes Who Hustle” is all about. we asked if she had a few minutes to chat, and the rest is history. Mindi is a saxophonist, vocalist and songwriter, two-time Grammy nominee, author and national trustee for the Recording Academy. 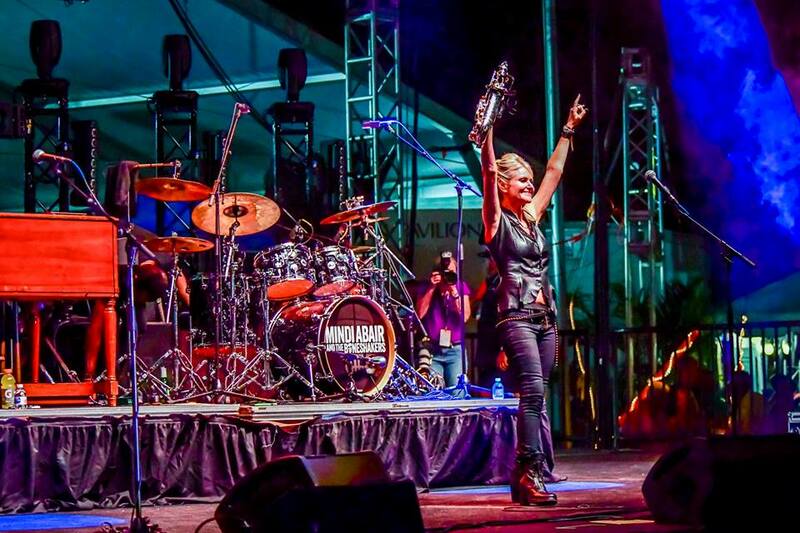 Her band, Mindi Abair and the Boneshakers, has toured with legends including Aerosmith and Duran Duran, and she had the opportunity of a lifetime when she was asked to play a night with Bruce Springsteen’s band. She’s a badass babe who is chasing her dreams and advocating for female representation in the music industry along the way. Very first job: I actually kept my check from my first gig, when I was in college at Berklee College of Music, and a singer/songwriter hired me to play saxophone with her. She picked me up in her beat-up car and drove me to this Chinese restaurant and we set up and played there, and I made $50. It couldn’t have been less glamorous. I ate some pork fried rice. I’ve got a little group of friends that I love. They’re not necessarily big, famous types, but I’ve got this group of power chicks. We’ll get together and we’ll drink margaritas together and talk about life. One of my girlfriends is Cheryl Pawelski. She owns her own record label called Omnivore Recordings, and she does all vinyl and historic recordings of people you’ve never heard that are cool and hipster and amazing. She's just a powerhouse. I grew up in St. Petersburg, FL, so I’m all about the beach. Getting tan with an adult beverage in-hand — that’s beautiful to me. I love wine. I just moved to Napa, and it’s just so fun to immerse in the art of different wines. My song, “Pretty Good for a Girl.” We sing it every night! Tell us about your hustle. What does your day-to-day look like at the moment? I’m doing a lot of touring right now. We were in Indianapolis last night, and now we’re at Bourbon & Beyond today. I go to Nashville tomorrow to write a few songs for our next record, and then in a couple of weeks we’re putting out a Christmas CD. We just finished [the CD], and it’s rocking—it’s so fun. It’s not your dad’s foo-foo, nice little Christmas record. It’s got some umph. After that, we’re just going to keep touring. We’re pretty much on the road a lot, so day in and day out is get up, figure out what city you’re in, play the show, make it to the next city. We’ve got a pretty full tour schedule and I love it; it makes me happy. How many people are in the team that makes the Boneshakers happen? We’re a pretty lean and mean little machine. It’s four guys and me on stage, and we have a tour manager who makes the sound for us. We’re a small team that can just go out there and take over the world on a daily basis—and I like that we’re a small team. My manager is a woman named Stephanie Gonzalez. She also manages George Benson — she’s a little tiger, a rock-and-roll chick, and she’s all heart and soul. It's so good that we’ve got some women power in the mix. I grew up on the road with my dad’s soul band; it was really high energy and fun. We didn’t even have a house until I was about 5; we just traveled. Once I started school, I took every opportunity to join every band department and every band or choir class they let me take. I never thought about what I would do for a living, I was just in that world of, I love doing this. When it did come time to think about it, I just thought, You’ve gotta go after something you love. I love to play. I didn’t know where I fit in, but I knew I wanted to write my own music and play in my own band—so that’s where I ended up. When did you start playing the saxophone? I started when I was 8 years old—I was a total product of my 4th grade school band. Our teacher put a bunch of instruments on the ground and said, “Pick one that looks cool.” I thought the saxophone looked loud and proud and cool, so I picked saxophone. I chose well. Luckily, no one told me it was odd for a girl to play the saxophone until it was too late. How has being a woman affected your professional experience? What can we do to create more equal, uplifting (and well-paying!) spaces for women in music? I think this past year has really shown the world — and it’s become apparent to most people — that it’s not an equal playing field, and it is harder for women—so how can we change that? I am a national trustee for the Recording Academy. We’ve had hours and days and weeks of conversations about it. The music industry itself is so skewed male-dominated — from bands to businessmen. Some people make it through, and some people say, Forget this, I don’t even want to play this game. I’m not sure I have the answers, but I do know the Recording Academy is really committed to changing things inside the organization and in the industry in general. Who are some women you admire in the industry? Loretta Munoz. She works with ASCAP, and basically helps any artist who is a songwriter or makes music, make better music by hooking them up with a network of opportunities for writers of any genre to get together and make music. I mean, how cool is that? Claudia Brant has been the number-one Latin songwriter for years and years and years; she’s written so many hits. Here’s a woman who has two kids and is keeping her family together, and writing hits, and doing all this amazing stuff. These are the people behind the scenes. Not everyone knows or gets the glory, but they’re keeping their families together and putting great art out into the world. I love that. Do women support each other in the industry, or do you think they have more of a competition mindset? People always feel that women are catty towards each other and we all push each other away—and I know that does happen, sometimes—but, I gotta say, with my friends and the women I’ve worked with, we’re really supportive of each other. We’re not catty, and I think we really have to change that [stigma] of people thinking that. We do have to be great to each other as women, but so many times in a tour situation or festival like this, they’ll think, Oh, we got a woman on the bill—OK, cool, check, we’re done; we’ve got diversity now. For many years, I’ve played at jazz festivals. There aren’t that many women in blues or rock, but go to the jazz world? Even fewer. There are a couple of saxophonists who are women, and they never put us on the same bill—but there will be 17 guys on the same bill. I always think we’ve got to change the way people see diversity. I definitely think we as women—we hold each other up, so that’s not what I see as the problem at all. What’s been one of your biggest career milestones? I played a night with Bruce Springsteen, and that was one of those moments you just can't even imagine. I’d been touring with Aerosmith, and I had just come off doing “American Idol” (where I was the featured saxophonist for a couple of seasons), and all of a sudden I got a call from Max Weinberg, Springsteen’s drummer. [He said] Clarence Clemons has just passed away, and they hadn’t replaced him. They knew I was a huge Clarence fan, and he asked if I would come in and play a night with them at a big event at the Beacon Theatre in New York. It was like a blur. I’m just such a big fan of what Bruce does and what an artist he is — to fill his shoes for a night was amazing. Bruce Springsteen would be it—and I got that chance to do a night with him, which is unbelievable. I got the chance to tour with another one of my favorite bands, Aerosmith. I toured with Duran Duran, which I loved. Really, the only bucket list I’d have is the Rolling Stones—that would be unbelievable. We’ll see if anything like that ever happens! For now, playing with the Boneshakers is enough for me. All photos property of Chyrisse Tabor of Rock at Night Photography.